Engine in Multimedia Analysis and Archive System. One thing we like was that the dtSearch Engine had an API we could work with, said Michael S. Allen, Project Manager for General Dynamics Information Systems. The Multimedia Analysis and Archive System (MAAS) provides the tactical analyst with the capability to capture and exploit the wide variety of multimedia data received in the tactical environment. The original digitized data and the exploited results are stored in a database. A query interface to the database allows any user connected to MAAS to perform keyword and content searches on the saved analysis information to retrieve multimedia data. 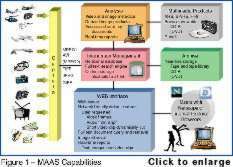 MAAS consists of four major capabilities: Capture, Information Management, Analysis and WEB Interface, Figure 1. The Capture capability provides the ability to capture the raw data either by digitizing and encoding an analog signal or importing digital data already digitized and encoded. In the near future, MPEG2 video will be supported and an interface to export and import NITF files from and to MAAS will be available. The Capture capability is designed to be adaptable to support new data types and data sources. The Information Management capability provides the relational database, the content search engine, the on-line storage and the archive. The on-line storage is scalable from 9 GB to greater than 1 TB. The archive supports a variety of near-line and off-line storage capabilities. The Analysis capability of MAAS allows the tactical analyst to enter mission information for the captured data including comments, mission description and latitude and longitude. MAAS allows the tactical analyst to easily associate ancillary data files of different data types with the video and image data. Ancillary data, including other video data, may be associated with a particular video clip or a specific frame of the video. The analyst searches the database using keyword and content queries. The Analysis capability also allows the tactical analyst to produce contemporary multimedia products derived from the multimedia data contained within the database. The analysis products are created using formats such as MPEG1 video, JPEG and GIFF images, and documents in html, MS Word® and MS PowerPoint® formats. The analysis products may be distributed through Information Management, the WEB Interface and/or on CD-R. Video clips and images may also be exported from MAAS into non-linear video editing software applications to create analog videotapes. The WEB Interface consists of the WEB server and a WEB browser interface to allow local and remote users access to the MAAS multimedia information using a standard WEB browser -- Netscape® and Internet Explorer®. The browser interface allows a WEB user to query with keyword and content searches for particular information. If the accessed data contains video, the WEB interface provides the user with a dynamic interface. This dynamic interface allows the user to view subsets of the video including thumbnails and short video clips. MAAS provides the tactical analyst with the ability to capture, manage, exploit and disseminate contemporary multimedia analysis information in a very scalable architecture taking advantage of very contemporary commercial hardware and software products. Specifications subject to change without notice. ©General Dynamics Information Systems Windows® NT, Office® 97, Explorer® are all trademarks of Microsoft Corporation. Netscape® is a registered trademark of Netscape Corporation.